The accomplishments of the natural world can inspire us to great engineering feats. Biomineralization is one particularly impressive trick nature pulls off. Vertebrates, invertebrates and plants all have ways to precisely position inorganic substrates into crystalline order. 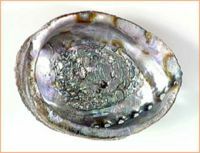 For example, calcium carbonate will form unstructured dust in the absence of genetically-programmed organizers, but the same material can be made into the hard and luminous shells of sea creatures. Similarly, diatoms organize silicon dioxide into intricate patterns that manufacturers of electronic components can’t begin to approach. In one more instance, bacteria align iron inside their cytoplasm to form magnetic rods on the submicron scale. These feats are accomplished without harsh chemicals, without extreme temperatures, and without noxious wastes that poison the nests of the organisms themselves. Humans have a lot to learn from nature’s successes. In the upcoming weeks we’ll use a virus that infects bacteria, namely the bacteriophage M13, and we'll rely on the self-assembling coat of this virus to template gold and silver nanowires. The interaction of metals with a protein on the phage coat yields nanoscale-particles with useful energetic properties, as we’ll see. The bacteriophage M13 is a member of the filamentous phage family. It has a long (~900 nm), narrow (~20 nm) protein coat that encases a small (~6.4 kb) single stranded DNA genome. The genome encodes 11 proteins, five of which are exposed on the phage’s protein coat and six of which are involved in phage maturation inside its E. coli host. The phage coat is primarily assembled from a 50 amino acid protein called pVIII (or p8), which is sensibly enough encoded by gene VIII (or g8) in the phage genome. For a wild type M13 particle, it takes about ~2700 copies of p8 to make the ~900 nm long coat. The coat's dimensions are flexible though and the number of p8 copies adjusts to accommodate the size of the single stranded genome it packages. For example, when the phage genome was mutated to reduce its number of DNA bases (from 6.4 kb to 221 bp) , then the p8 coat “shrink wraps" around the reduced genome, decreasing the number of p8 copies to less than 100. 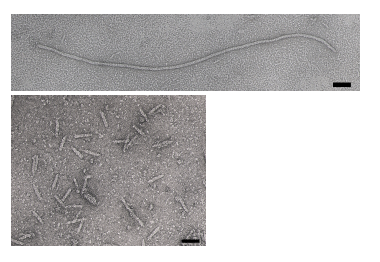 Electron micrographs of the resulting “microphage” and its wild type parent are shown below (image courtesy of Esther Bullitt, Boston University School of Medicine), where the black bar in each image is 50 nm long. And what about the upper limit to the length of the phage particle? Anecdotally, viable phage seems to top out at approximately twice the natural DNA content. However, deletion of a phage protein (p3) prevents full escape from the host E. coli, and phages that are 10-20X the normal length with several copies of the phage genome can be seen shedding from the E. coli host. The general stages to a viral life cycle are: infection, replication of the viral genome, assembly of new viral particles and then release of the progeny particles from the host. Filamentous phages use a protein at their tip, namely p3, to contact a bacterial structure known as the F pilus to infect E. coli. 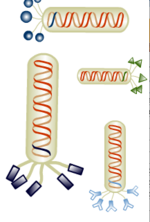 The phage genome is then transferred through the pilus to the cytoplasm of the bacterial cell where resident proteins convert the single stranded DNA genome to a double stranded replicative form (“RF”). This DNA then serves as a template for expression of the phage genes and produces new phage particles that shed off the surface of the infected cell. Other phage are known to lyse their host cells but in the case of M13 and E. coli, they co-exist in a balanced way, allowing the growth of both host and virus, though the infection does slow down the doubling time of the E. coli (as we'll see later today). Despite phage display techniques being available for more than a generation, this tool has been applied only recently to the search for novel materials. Largely it’s been Angela Belcher and her lab who highlighted and then demonstrated the usefulness of this search tool for finding peptides that interact with materials to meet human needs. That M13 could interact with inorganic materials could not have been predicted from the original genetic studies on the phage, but there was also no one who had tried it. Phage that can bind to cobalt oxide, gold, iridium and indium tin oxide are all in-hand thanks to their work (e.g see reference ). Today you will harvest and titer a phage that can bind to gold since these can be used to build nanowires next time. In advance of this lab, a bacterial host ( XL1-blue) was infected with the modified M13 phage called "8#9." The p8 modification (=VSGSSPDS) was isolated from a library of p8 mutants that enable the phage to bind thin gold films PMID: 16178252. Today you will harvest the phage from the supernatant of the infected bacterial culture and then titer it. You will begin the lab by preparing the gold and silver solutions you'll need for next time. You should wear your lab coat, your safety glasses and gloves throughout the preparation of these materials for your chemical synthesis. Each group should make 20 ml of a 0.1 M solution of hexadecyltrimethylammonium bromide ("CTAB"). The molecular weight of CTAB is 364.45 and the solution can be prepared in distilled water in a 50 ml conical tube. Your group will be responsible for making one of the following solutions that the class will use in the synthesis of nanowires. Pool the volume you make with a second group making the same solution if there is another group assigned this task. Spin 10, 000 rpm, 10 minutes (you will be shown where down the hall you can find a centrifuge to spin this volume). Transfer the supernatant to two clean Oak Ridge tubes. The transfer should be done with a plastic pipet and a bulb so you can measure the volume of supernatant. Invert to mix then incubate on ice 60 minutes. Spin at 15, 000 rpm for 15 minutes. A white pellet may be visible...these are your precipitated phage. If you can't see a pellet keep going, but be aware of where the pellet you can't see is in the tube and don't scrape a tip against it or you will accidentally remove it. Resuspend the pellet in 3 ml sterile H2O. This is best done by adding 3 ml of H2O to one of the Oak Ridge tubes, washing the water up and down the side of the tube with the phage pellet, and then moving the 3 ml of phage solution to the second tube and dissolving that pellet as well by washing the water up and down the side of the tube. Split the phage solution between three eppendorf tubes. Aspirate the supernatant and resuspend the pellets (if you can see them) in 1.5 ml TBS--using 0.5 ml to resuspend each pellet and then pooling the volumes into a larger (2 ml) microfuge tube. This is your phage stock (yay!). Titer as described below and store the remainder at 4°C until next time. The idea of this technique is simple. Since phage infection slows down the growth of bacteria, any phage-infected cell will grow less quickly than an uninfected one, giving rise to a zone that is more clear on a lawn of fully grown cells. This zone is called a plaque and by counting the number of plaques formed, it is possible to measure the number of infective phage in the sample you are testing. The number of infected phages is measured as PFUs, which is "plaque forming units per ul." Start by placing 4 LB plates in the 37° incubator to prewarm them. If there is any condensation on the surface of the plates, then you can leave the lids slightly ajar to dry the plate surface. Aliquot 200 ul of bacteria into 4 small, sterile test tubes(not eppendorfs). The bacteria you are using are the strain ER2267 since this strain has a selectible F'. Label the tops of each tube with a colored sticker and one of the following: none, 10^6, 10^8, and 10^10th. Serially dilute the phage stock you isolated in today's earlier protocol, making stepwise 1/100 dilutions in eppendorf tubes. For example, add 10 ul of a phage stock to 990 ul sterile water for a 10^-2 dilution, then repeat, using 10 ul of the 10^-2 dilution into 990 ul sterile water to make a 10^-4 dilution. Vortex the dilutions before removing any liquid and change pipet tips to prepare each new dilution. Continue serially diluting the phage to final concentrations that are 10^-6th, 10^-8th and 10^-10th as concentrated as the starting stock. Mix 10 ul of the 10^-6 dilution into a tube with bacteria. Mix 10 ul of the 10^-8 dilution into another tube with bacteria. Mix 10 ul of the 10^-10 dilution into another tube with bacteria. One of the teaching faculty will show you how to mix 3 ml of top agar into the uninfected sample you have prepared and how to pour the molten mix onto the surface of a prewarmed LB plate. 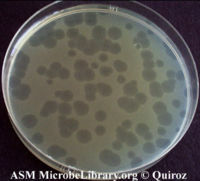 You and your partner should add top agar to the other samples and plate the cells as you were shown. Allow the top agar to solidify by leaving the plates on the bench at least 5 minutes then stack them and wrap them with your colored tape and finally move them to the 37° incubator to grow overnight. One of the teaching faculty will remove them from the incubator tomorrow and store them for you until next time. Give your undiluted phage stock to one of the teaching faculty who will store it for you at 4°C until it is time to react it with the gold and silver. The erlenmyer flask which held the phage and bacterial culture can be rinsed with a squirt 10% bleach and then rinse out well with water (three times is perfect). Place in the bin next to the sink (it will be washed in the dishwasher). Yellow capped test tubes: yellow caps are to be saved for reuse - please place in the bin next to the sink. Test tubes may be disposed of in the sharps bin. Oak Ridge Centrifuge tubes: please rinse with a squirt of 10% bleach and then rinse out well with water (three times is perfect). Place in the bin next to the sink (it will be washed in the dishwasher). The primary assignment for this experimental module will be for you and your partner to develop a scientific research proposal. For next time, please describe five recent findings that might define an interesting research question. You should hand in a 3-5 sentence description of each topic and list the reference that led you to each item. The topics you pick can be related to any aspect of the class, i.e. DNA, system engineering, or bio-material engineering. During lab next time, you and your partner will review the topics and narrow your choices, identifying one or perhaps two topics for further research. Autoclaved then 100 ml aliquoted to 250 ml bottles. Stored at RT. Melted in microwave 2’ then keep molten in 55° water bath. 20g of Agar for plates. Autoclaved 30 minutes with stirbar. Poured when ~55°. Plates dried ON on bench and store in sleeves in 4°. This page was last edited on 13 November 2009, at 08:28.